Well, it's Thursday and I'm off work. Tomorrow, too. Then I go back to work for 2 days and then off for another 2 days. It's kind of like a split vacation, isn't it? I had the Funeral Director mail me my Mom's bill. $423 for the obituary. Pricey, eh? I will pay it sometime this AM in order to get the discount. There was an email update on my tickets to see Aquaman. We're being moved to a different theater, from #10 to #12, most likely because they've sold so many tickets. I've never been to an early show before so this might be... interesting. In case you didn't know, certain individuals who are really into DC Comics, or Marvel Comics, and who really love a specific Super Hero like to dress up like that Super Hero. This means there might be Superman, or Batman, or maybe even an Aquaman, or several of each, sitting in the audience with us. If there's an Aquaman, I hope it's someone who works out. Can you just imagine? No, I didn't see any of the George H memorial service yesterday. I did see a couple of still shots. I understand the Idiot Jerk shook hands with every living president except Jimmy Carter. Perhaps he was worried the skin might burn off his hands, or his face, or that his phony crown of fake hair might burst into flames. 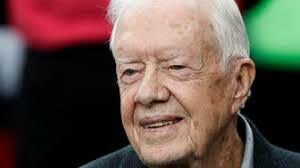 Jimmy Carter is a very honorable, very good man. I understand his touch is worse than Holy Water to an evil the likes of the Idiot Jerk. Of course, I do believe Jimmy has criticized the Idiot Jerk for being a moral degenerate so the lack of a handshake may actually have been so some sort of snub. Nah... I think the Idiot Jerk was more afraid of being set on fire. And, on the financial front, if you're thinking the Wall Street might bounce back today, well... that might not happen. It seems the Canadians arrested some chick named Meng, who just happens to be the CFO of Huawei, which just happens to be the super duper telecom corporation from China, for the purpose of extraditing her to the US. China is furious. Think ripple effect. And I doubt very much if the Canadians said to themselves "hey, let's arrest this chick and ship her off to the US." Nah. You can bet there was pressure applied because the Republican party has never been too smart, and with the Idiot Jerk in charge they've been dumber than bricks. They would see her as a 'bargaining chip." Wrong. Jimmy! Bring out your Holy Water now! _____ only shook hands with the Obamas. Bill looked at him, but Hillary and the Carters did not. Assholes dont usually have any manners I like to think trump is only upset and whiney because he himself knows he isn't the in popular click. Or maybe he'd just been told "we arrested this chick named Meng... AND ALL HELL IS GOING TO BREAK LOOSE!! the dump was not allowed to speak yesterday. as bob said, he sat there and grumped; he may have even taken a dump in his diaper in church. Even Faux News pointed out how when he and Melanoma entered expressions turned grim and the idle chatter stopped. What the hell is a smoking saw?